Spinal decompression therapy is a non-surgical, drug-free traction therapy for the relief for the cervical or lumbar spine. The spinal decompression machine stretches the spine, creating negative pressure that enlarges the space between the discs. This motion balances the pressure that has built on the affected discs over time and eventually allows the disc to return to normal position. During this procedure, by cycling through distraction and relaxations phases and by proper positioning, a spinal disc can be isolated and placed under negative pressure, causing a vacuum effect within it. This vacuum effect accomplishes two things. From a mechanical standpoint, disc material that has protruded or herniated outside the normal confined of the disc can be pulled pack within the disc. Also, the vacuum disc is stimulated in growth of blood supply, directly stimulating a healing response. This results in pain reduction and proper healing at the injured site. Here is a video to show a bit more. -"Absolutely love you guys. You have been friendly and caring of my needs. This is the best I have felt in years. I didn't realize how important this care is until I began your treatment. I have gone to other businesses and have never been this happy and never felt better!" -“I was experiencing neck pain when I tried to turn my head from side to side. I had almost no neck flexibility. 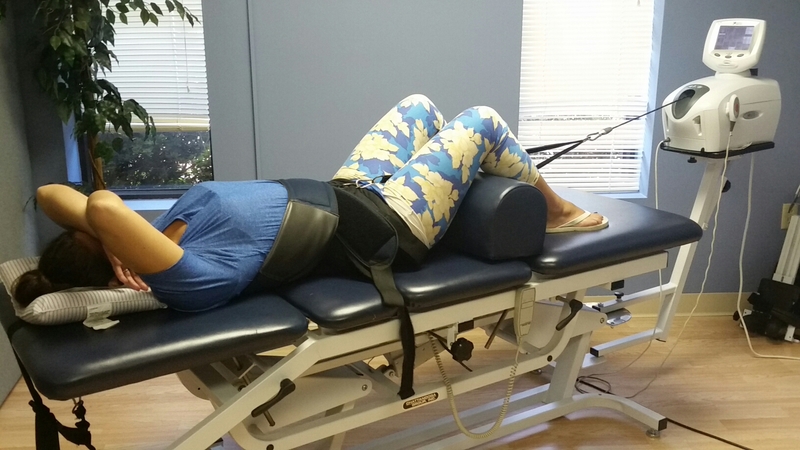 After decompression treatments pain began to lessen and I could look side to side. Currently, after completing treatments, I have no neck pain and have full neck movement. -“When I came to this office I was in a lot of lower back pain to the point of little or no movement. I had spent 6 weeks in a doctors’ care from an on-the-job injury. This doctor gave me medicines [muscle relaxers] and recommended rest. The pain was still as bad as the beginning. Upon the first visit to the clinic I saw on my x-rays I had bad disk spacing at the L-5 vertebrae and nerve. Nine treatments later [with Spinal Decompression treatment] worker’s comp sent me to a specialist and upon his x-ray all disk spacing and nerve openings were equally spaced. His statement to me was “whatever [I] had been doing, keep it up.” I feel the only treatment I was doing at this time was in this office. The WellnessFirst Team is great—not only with treatments, but it is always good to see a smiling and positive reinforcement every visit. -"I began going to WellnessFirst Chiropractic of Sullivan for severe lower back pain. I started on a 4 week program three days a week of spinal decompression, physical rehabilitation and stretching, and denner roll. Four weeks later, my pain is almost completely gone! #TeamWellnessFirst is very friendly and helpful, too! Don't suffer from back pain, give them a call!"